If you’ve always wanted to try out fishing, or want to take your kids, grandkids, nieces, nephews, neighbors, or anyone at all to experience this great American tradition, make sure you pay close attention. 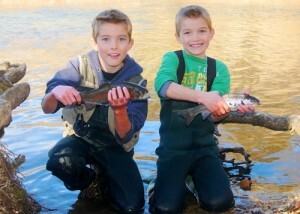 June 2-4 are Free Fishing Days in Virginia! No fishing license of any kind will be required for rod and reel fishing, in freshwater or saltwater, for these three days. Maybe you remember fishing as a kid and want to try it out again, but don’t think you have enough time to justify buying a license. Here’s your chance to wet those lines, without having to fork out the money for a license that you don’t think you’ll use more than once. Around Cabin Creekwood, fishing options abound. You can try your hand at fly-fishing for trout in Back Creek, just 1/4 mile from your cabin. Or head down to Sherando Lake, 1 mile away, to pursue Largemouth Bass, Catfish, Bluegill, and Trout. The South River near Waynesboro has a special regulation area which is home to trophy size trout, and if you need some help getting started, our friends at the South River Fly Shop will be glad to point you in the right direction. You can even hire a guide who will teach you how to fish and take you to the best fishing holes if you want! Our guests who have done so rave about their experience! However you choose, the free fishing days of June 2, 3, and 4 provide the perfect opportunity to dust off that old rod and reel, string on a new fishing line, and take the kids on a trip down memory lane.